There are many possibilities of flooring options for a home or a business, and selecting the right one depends on the building structure and its purpose (whether it’s a home or a business) and the personal tastes of the owner. Tile is a popular choice for flooring- it’s beautiful, tasteful, and can often be custom designed. But there are multiple types of tile flooring, each with its various benefits and downsides. When selecting a type for installation or removing a tile floor in order to make room for a new one, it’s important to know your options. One of the oldest materials used in pottery, ceramics are composed of mixtures of clay, talc, silica, carbon, and other nonmetallic elements. These materials are mixed together and fired in a kiln. The high heat causes the materials to harden and solidify, resulting in a range of products, including ceramic tile. This type of tile is popular because it is durable, low maintenance, and very easy to clean. Over time, ceramic tile won’t degrade or become tarnished if it is cared for properly. This makes it a popular choice for a long-lasting floor that is less costly to install and maintain. Saltillo tile, also known as terra cotta tile, is one of the most distinctive types of tile flooring. This material originated in Saltillo, Mexico. It’s composed of pure, natural clay deposits found in that region of Mexico. These materials are mixed with water, sun-dried, and then kiln-fired to harden the tiles. Terra cotta tiles similar to saltillo are also produced in Italy and Spain. Because the materials used to make saltillo or terra cotta tiles are porous (rather than dense), these tiles absorb liquid and can become damaged or worn easily. It is recommended that these tiles be sealed and polished, and be maintained regularly. Although these types of tile flooring require more intensive care, they are highly prized for their unique, elegant look and rich colors, which range from yellow to deep red. Porcelain is an ancient building material created in China over 2,000 years ago. It’s usually made from kaolin, a type of clay, but different varieties can contain a wide range of minerals or other earth-derived materials. Today, it’s produced around the world for a wide variety of purposes, including for use in tile. Porcelain tile tends to be more expensive than ceramic and more difficult to install due to its weight. However, it’s a popular choice because it is denser and harder than many forms of ceramic, making it more durable. It also absorbs less water, meaning that it requires less maintenance over time. Porcelain tile can be glazed (to give a shiny, glossy appearance) or be left unglazed, and comes in a range of colors and designs. Unlike ceramic, saltillo, or porcelain tile, slate tile is not made from clay. Rather, it comes from cutting and fitting slabs of thin, fine-grained rock that usually forms from compressed sediment and minerals like quartz. The rock is usually extracted from quarries. It’s a great material for tile because it is naturally smooth and thin, making it easy to cut and shape into custom tile formations. Slate tile is popular because it is long-lasting, hard, and resistant to scratches or damage. It also provides an elegant, rustic look in homes and can range in color and patterning based on the natural formation of the rock used. Similarly to slate tile, travertine is not made of clay but rather of a form of rock. Unlike slate, however, travertine comes from limestone, which is usually formed from mineral deposits caused by hot springs. These tiles are usually light in color, ranging from white to tan or cream-colored varieties, but they can also be slightly-dark, even rust colored. Travertine is a less expensive alternative to marble or slate, can come in a range of styles and colors and are relatively easy for installation. They are also sustainable, coming from naturally-occurring stone rather than manufactured materials. The downside of these types of tile flooring is that travertine tiles are porous, absorbent, and easily damaged by certain materials sometimes found in cleaning products. No matter their differences in composition, style, or cost, all tiles are difficult and expensive to remove from the home using traditional methods. Also, this process can be extremely hazardous. For every square foot of tile removed, a pound of fine dust is created. When this dust enters the air, it can trigger asthma attacks, damage furniture, create the need for time-consuming clean-ups, and even contribute to chronic and terminal respiratory diseases like lung cancer. 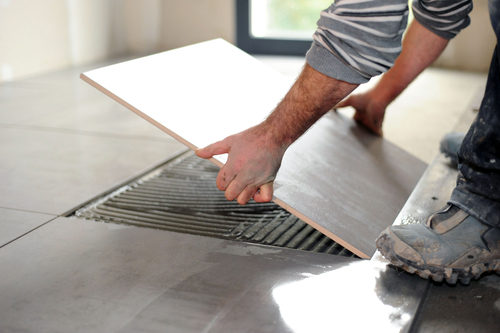 However, at Dustbusters Floor Removal, we utilize a process that eliminates the dust output from tile removal. This makes for a safer, quicker, cleaner, and less expensive floor removal process. No matter your preferences with regard to types of tile flooring, if you’re interested in changing your floor surface, Dustbusters is the way to go for the removal portion of the process. Call today at 866-883-8783 for information about consultation and removal.